Experience a moment away from the external stimulus of the day. Relax and dive deep into the soothing sounds of the didjeridu and quartz crystal singing bowls. This is an event to lie down comfortably on a mat with a warm blanket and relax into the sound frequencies. Bring your own mat and blanket. Mats and blanket are also available at Yoga by the Sea. Come early to claim your spot, and get comfortable. We start on time. Being passionate about music his whole life, Chris Niebergall was entranced by the sound of the didjeridu upon his first listen in 2003. It was like a reunion of something innately familiar in this lifetime. He then became obsessed with searching everything he could to learn more about it. Later on in 2005, he received one. As there wasn’t anyone around teaching at the time, he went off into the woods to listen for the sound of the didjeridu to guide him in learning and he started to play. Since then, he has learned from deep listening and he has apprenticed with renowned Didjeridu Master Shine. 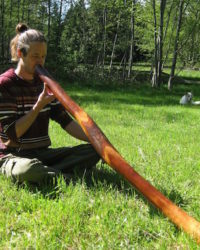 Chris offers didjeridu sound therapy for gatherings or individual sessions. He also crafts didjeridus and offers lessons. 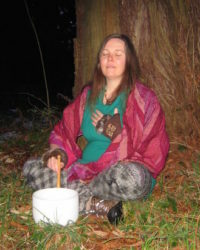 Kym has done extensive self study on crystal healing and has practiced vibrational healing through the use of Tuning Forks, Crystal Singing Bowls and voice. She believes natural sound vibrations have a tremendous power to facilitate release, transformation and also to bring peace, relaxation and rejuvenation. Kym feels blessed to steward 7 crystal quartz singing bowls tuned in 432hz and uses them in her healing practice as well as for public engagement. She is a certified Reiki Master and combines energy work with her sound healing practice to deepen the experience for others.